Dr. Rosanna Forteza received her M.D. from the National University of Córdoba School of Medicine, Argentina in 1987. She received her clinical training in internal medicine and in pulmonary and critical care medicine in Argentina. Her research career began in 1991 when she moved to the University of Miami at Mount Sinai Medical Center where she met Drs. Adam Wanner and William Abraham and became interested in airway biology and the physiopathology of asthma. As a research fellow of the Division of Pulmonary and Critical Care Medicine she focused on kinin generation as a factor in maintaining airway inflammation. In 1995, she moved to the University of Miami where she met her mentor Dr. Gregory Conner from the Department of Cell Biology and Anatomy, who guided her through cell and molecular biology techniques applied to airway biology. After discovering that hyaluronan is a key regulator of the enzymic activity of a kinin generating enzyme, a concerted effort has been established with Drs.Conner and Matthias Salathe (see profiles below) to determine the role of hyaluronan in the airways and its contribution to airway homeostasis. Currently Dr. Forteza is an Assistant Professor of Medicine, committed to the research effort of the Division of Pulmonary and Critical Care Medicine at the University of Miami School of Medicine. Dr. Conner received his B.A. in Molecular Biology from Vanderbilt University in 1972 and his Ph. D. in Biochemistry and Molecular Biology from the University of Florida in 1978. He then joined the Laboratory for Cell Biology with Günter Blobel at The Rockefeller University, New York where he worked on the biogenesis of the lysosomal enzyme cathepsin D. Dr. Conner moved to a faculty appointment in the Department of Cell Biology and Anatomy at the University of Miami School of Medicine in 1984. Dr. Conners current research interests center on the metabolism of reactive oxygen species in the airway and the role of peroxidase in airway host defense against infection. Currently, Dr. Conner is Associate Professor of Cell Biology and Anatomy and the Director of Research of the Division of Pulmonary and Critical Care Medicine at the University of Miami School of Medicine. A native of Switzerland, Matthias Salathe received his M.D. from the University of Basel, Switzerland, in 1986. After clinical training in Switzerland, he moved as a research fellow to the University of Miami in 1991, where he started to examine the cellular and molecular regulation mechanisms of mammalian cilia. After completing a postdoctoral fellowship supported by the Howard Hughes Medical Institute in the Department of Molecular and Cellular Pharmacology, he was appointed as a faculty member in the Division of Pulmonary and Critical Care Medicine in 1997, where he currently holds the rank as an Associate Professor of Medicine and Molecular & Cellular Pharmacology. The discovery that hyaluronan regulates ciliary beating in the airway started a productive collaboration with Drs. Conner and Forteza. During quiet breathing, the airways conduct up to 20,000 liters of air per day to the alveoli. Even under clean air standards, up to 1  2 x 105 bacteria (~8500 bacteria/m3 air) and up to 100 mg of inert dust can be inhaled daily. To deal with this challenge, the airway mucosa must provide a sophisticated defense against airborne material of a variety of sizes and composition. One of the defense systems that protect the airways is the mucociliary apparatus. It consists of a ciliated epithelium, covered with secretions produced by mucous (goblet) cells and submucosal glands (Fig. 1). Under normal circumstances, inhaled particles that are deposited onto the airway surface are trapped in mucus and then transported to the glottis by the coordinated action of cilia. Secretions themselves provide additional defense to assist this mechanical removal of foreign particles. These secretions contain a variety of antibacterial products, such as lactoperoxidase, lysozyme, lactoferrin, or antiproteases, such as secretory leukoprotease inhibitor (SLPI) and tissue inhibitors of metalloproteases (TIMPs) that work in concert to maintain airway sterility and homeostasis. Since respiratory secretions are constantly cleared by ciliary action, it has been believed that the rates of synthesis and secretion of different defense molecules are the main determinants of their availability and activity on the epithelial surface. This paradigm has also been applied to other mucosal surfaces where secretions are rapidly and continuously removed, such as tears removed by blinking or intestinal secretions removed by peristalsis. In this article, we review our recent evidence that challenges this concept and discuss the findings that hyaluronan retains certain enzymes important for homeostasis at the apical surface of the airway epithelium, protecting them from removal by mucociliary clearance. Such mechanisms may work on other surfaces where hyaluronan is present. The airways, tubular structures that conduct the air from the mouth to the gas-exchanging units (alveoli), are lined by ciliated pseudo-stratified columnar epithelia that contain mucous secreting goblet cells. The lamina propria lies beneath the basement membrane and contains loose connective tissue with bundles of longitudinally arranged elastic fibers. A layer of smooth muscle forms the outer ring of the lamina propria. Submucosal glands are found beneath the lamina propria. In airways up to 2 mm in diameter, an additional outer layer is present that consists of collagen fibers and cartilage. The secretions that cover the airway epithelium are usually divided into two layers: a mucous layer containing macromolecules (mainly O-linked glycoproteins or mucins), where trapped inhaled particles are retained, and a periciliary fluid layer in which cilia beat, moving the overlying mucus layer towards the glottis where they are swallowed. Hyaluronan is a known and important component of the extracellular matrix in the lung parenchyma and has a critical role during lung development. Alterations in hyaluronan size, deposition and/or turnover are associated with inflammatory cell influx into the interstitial space,1,2 with tumor genesis and metastasis, and with bleomycin-induced interstitial lung fibrosis and scar formation.3-6 Hyaluronan has also been found in airway secretions, but its role there has not been extensively studied previously. This secretory hyaluronan is the topic of this discussion. Numerous publications in the early 1970s examined the content of hyaluronan in human bronchoalveolar lavage from normal and diseased lungs. Increased hyaluronan levels were found in asthmatic and chronic bronchitic patients, as well as in patients suffering from alveolar proteinosis and adult respiratory distress syndromes.7-9 Increased hyaluronan content in bronchoalveolar lavage was interpreted as a sign of interstitial tissue damage. In 1988, however, hyaluronan was shown to be secreted from normal submucosal gland cells in culture.10 Furthermore, hyaluronan was later found to be a product of serous cells of submucosal glands and, therefore, a normal constituent of bronchial secretions.11,12 In addition to these findings in the airway, hyaluronan is also present in other exocrine secretions, including saliva,13 seminal fluid,14 normal secretions from the small intestine,15 and normal secretions from the nasal mucosa.16 On mucosal surfaces, hyaluronan is thought to be important in mucus hydration, surface protection and epithelial repair, all essential for adequate mucociliary clearance in the airways. For example, if the viscoelastic properties of mucus are altered or the repair of the epithelium is compromised, the ability of cilia to transport mucus that contains foreign material out of the bronchial tree will also be impaired. On mucosal surfaces, hyaluronan can also serve additional roles, such as providing a vehicle for cell migration and growth factors as well as interacting with proteases and protease inhibitors present in bronchial secretions. We have been studying tissue kallikrein (TK) and airway lactoperoxidase (LPO), two key enzymes critical for airway mucosal defense that are secreted onto the airway surface. TK is produced in submucosal gland cells and is involved in allergic bronchoconstriction. LPO is produced in both surface epithelial goblet cells and submucosal gland cells, and is involved in hydrogen peroxide scavenging and bacterial clearance. TK is a serine protease that by cleaving kininogens, generates lysyl-bradykinin in the airways. Bradykinin is an important mediator of airway inflammation and has been implicated in the pathophysiology of asthma. While studying the regulation of the enzymatic activity of TK in the airways, we found that bronchial TK associates with hyaluronan and that this inhibits its enzymatic activity.17 The first experiment suggesting that TK binds to hyaluronan was its unusual elution behavior from anion exchange columns loaded with bronchial secretions. In contrast with other kallikreins, such as pancreatic and urinary kallikrein, that elute between 0.3-0.5 M NaCl, bronchial TK eluted at 1.8 M NaCl. This stronger binding suggested an association of TK with a negatively charged molecule. Candidate molecules present in airway secretions were the glycosaminoglycans hyaluronan, heparan sulfate and chondroitin sulfate that are secreted from submucosal glands. Sample digestion with Streptococcus hyaluronidase normalized the chromatographic behavior of TK while chondroitinase ABC (used at pH 7.5 at which little hyaluronidase activity is present) or heparinase did not. Bronchial TK could also be purified by affinity chromatography on HA-Sepharose. These data clearly showed that TK binds to hyaluronan. Hyaluronidase treatment of bronchial secretions increased the activity of TK by ~ 600 %. While inhibition constants are difficult to assess for large polymers of hyaluronan, preliminary experiments using recombinant TK suggest that fragments of at least 10 disaccharides can inhibit TK activity. Because TK is a serine protease that can cleave small fluorescently labeled peptides, inhibition of its enzymatic activity by hyaluronan can be visualized by a membrane overlay technique that uses a moist cellulose acetate membrane, pre-impregnated with a fluorescent substrate for TK (Fig. 2). Supernatants from submucosal gland cell cultures were electrophoresed in non-denaturing conditions, and enzyme activity was visualized by overlay with a membrane containing a fluorescent TK substrate. (a) Lane 1: an untreated sample showed a faint smear of TK activity. Lane 2, 3: hyaluronidase treatment for 3 hours (lane 2) and for 18 hours (lane 3) incrementally increased TK activity while decreasing its molecular heterogeneity as shown by the single band of activity in the 18 hour sample that co-migrates with recombinant TK (lane 4). (b) Addition of hyaluronan restored the heterogeneity. Lane 1: hyaluronidase-digested sample, lane 2: sample before digestion, and lane 3: addition of excess hyaluronan to the digested sample. Reprinted with permission from Am J Respir Cell Mol Biol 21(6):666-674.
a See review by Day in this series. On the other hand there are a growing number of hyaluronan-binding proteins that are unrelated to each other at the primary sequence level. While the TK sequence does not contain a link module, there are clusters of basic amino acids close to the catalytic site on its surface that are good candidates for hyaluronan-binding (Fig. 3). The exact binding site, however, is under investigation. H64 and S214 are the active catalytic sites (red); putative hyaluronan-binding sites are surface clusters of the basic amino acids R56, H57, H119, K169, K170 and K224 (blue). We used immunohistochemistry to localize TK in the airways and found it as expected in submucosal gland cells but also, to our surprise, along the ciliated border of the airway epithelium (Fig. 4). In addition, localization of TK in primary cultures of ovine airway epithelial cells, which contain submucosal gland cells, revealed specific staining along cilia. Lactoperoxidase (LPO), another enzyme secreted into the airways, also localized to the ciliary border. There are no known receptors for these enzymes on the epithelium. However, hyaluronan was present at the same location (Fig. 4), and therefore, we wondered whether hyaluronan might be involved in immobilizing these enzymes at the apical border of airway epithelial cells. 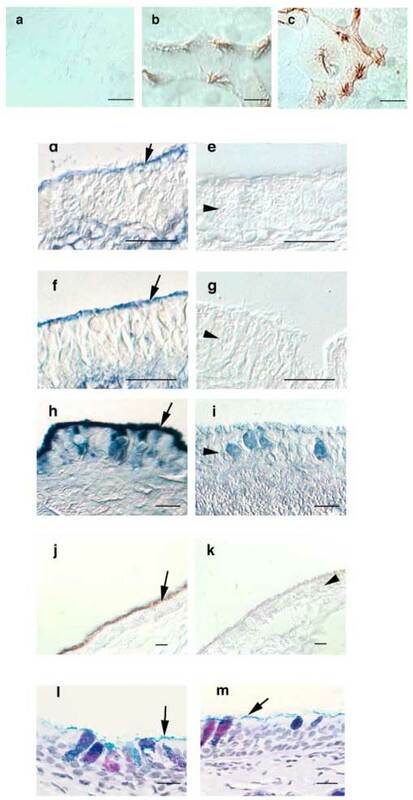 Hyaluronidase treatment (but not chondroitinase ABC at pH 7.0, or heparinase) eliminated the apical staining for hyaluronan, LPO and TK, but did not remove all glycoconjugates from the apical border of the epithelium as indicated by the retention of Alcian-blue and PAS positive material there (Fig. 4). While we know that hyaluronan interacts with TK specifically, the LPO amino acid sequence does not reveal a specific hyaluronan-binding site. LPO does have an alkaline pI, and it is therefore possible that it binds to hyaluronan by ionic interactions. However, hyaluronan does not have the highest charge density of the glycosaminoglycans present in the airways, and it is also possible that LPO binds through ionic interaction to another glycosaminoglycan that is associated with hyaluronan. Our experiments could not distinguish between these two possibilities. In summary, these data suggest that nascent or cell membrane-bound hyaluronan retains TK and LPO at the airway epithelial surface. Our results differ with a previous histochemical report of hyaluronan localization in the airway epithelium24 that found it limited to the basolateral compartment of the epithelium. These authors used paraffin embedded sections obtained from pathology archives, and it is possible that differences in conservation or processing of tissues could explain this apparent discordance. (a); anti-LPO (b); or anti-TK antibodies (c) and visualized with horseradish peroxidase-conjugated second antibodies. Specific staining of cilia can be seen. Paraffin sections of trachea were stained with a biotinylated hyaluronan-binding protein and avidin-alkaline phosphatase (d-g) showing that hyaluronan is localized to the ciliary border of the epithelium in addition to its known localization in the submucosal interstitium. Incubation with hyaluronidase removed specific staining for hyaluronan (e), whereas incubation with chondroitinase ABC at pH 7.5 did not change the staining pattern for hyaluronan (f). When chondroitinase ABC was used at pH 5.6, where it has hyaluronidase activity, hyaluronan staining was also removed from the sections (g). Labeling with anti-LPO antibodies and nitro blue tetrazolium / 5-bromo-4-chloro-3-indolyl-phosphate (h) or anti-TK antibodies and diaminobenzidine (j) also revealed specific staining along the ciliary border of the airway epithelium. Incubation with hyaluronidase removed LPO (i), and TK (k). Hyaluronidase did not remove all glycocongugates from epithelial border as evidenced by Alcian blue-PAS staining before (l) and after (m) treatment. All bars are 10 µM. Arrows depict the ciliary border of the epithelium. Arrowheads point to the epithelial cell layer (in i also to a goblet cell). Reprinted with permission from FASEB J 15(12):2179-2186. We used an additional approach to visualize the interaction of hyaluronan with TK as well as with the apical pole of the airway epithelium and to test its biological relevance. Tracheas, freshly isolated from euthanized sheep, were used under ex vivo conditions by applying fluorescently labeled proteins to their luminal surfaces. Because the cilia of these preparations keep beating in a coordinated fashion that transports bronchial secretions towards its proximal end, the movement of fluorescence can be visualized as it would in vivo. As seen in figure 5, TK labeled with fluorescein is immobilized at the site of application whereas bovine serum albumin (BSA) labeled with rhodamine moves by mucociliary action. This movement results in the separation of the original orange fluorescence in the mixture into clearly defined green (TK) and red (albumin) bands. This shows that BSA moves freely towards the proximal end of the trachea while TK is immobilized. The TK was immobilized by hyaluronan because the combined fluorescein-rhodamine fluorescence moved together towards the proximal end of tracheas pretreated with hyaluronidase. Binding to hyaluronan modulates TK but not albumin movement by the mucociliary transport system. Tracheas from freshly euthanized sheep were opened at their membranous portion. White arrows point to the proximal end of the trachea and represent a length of ~2 cm. Panels a/b and c/d show the same trachea at time 0 (a and c) and after 30 minutes (b and d). Fluorescein-labeled TK and rhodamine-labeled albumin were mixed and applied to the tracheal surface, revealing an orange fluorescence mixture at time 0 (a). After 30 minutes of incubation at 37°C (humidified), fluorescein-labeled TK did not move as indicated by the stripe of green fluorescence at the location of application, whereas albumin, represented by red fluorescence, has separated from TK towards the proximal end of the trachea (movement of ~ 2.5 cm in this experiment) (b). The other trachea was pretreated with hyaluronidase, and the TK/albumin mixture was applied (c). Now, both TK and albumin were transported without separation for ~ 2.5 cm during the 30 minutes observation period (d). Reprinted with permission from FASEB J 15(12):2179-86.
b See review by Turley and Harrison in this series. Since RHAMM is expressed in sperm flagella, which share ultrastructure features with cilia, and regulates flagellar movement, we examined the expression of RHAMM in ovine tracheal epithelia using immunohistochemistry and PCR. An anti-RHAMM antibody (R36 kindly provided by Dr. R. Savani, University of Pennsylvania) reveals specific staining for RHAMM at the apical portion of ciliated cells, but no staining in goblet cells (Fig. 6). Immunocytochemistry also demonstrated the presence of RHAMM in ciliated cells in culture. Further support that the epithelial epitope recognized by the antibody was in fact RHAMM was obtained by using our ovine tracheal mucosal cDNA library and specific primers for RHAMM. PCR reactions yielded bands of the expected sizes that co-migrated with an amplified control from mouse RHAMM cDNA. The fragment was sequenced (GenBank accession number AF310973), and the deduced amino-acid sequence was 91 % identical to the human and 81% identical to the mouse sequence. Fig. 6　Immunohistochemistry and immunocytochemistry for RHAMM in sheep airway epithelial cells. Cultured cells (d) or tracheal sections (a-c) were stained with a specific, affinity-purified RHAMM antibody (a,c,d) or with pre-immune serum (b). The apical portion of ciliated cells (including the cilia themselves) were specifically labeled (a, c), whereas goblet cells were not (c). Arrows indicate goblet cells. Reprinted with permission from FASEB J. 15(12):2179-86. Since hyaluronan binding to RHAMM enhances sperm motility, we also studied the effect of hyaluronan on ciliary beat frequency (CBF) in vitro using digital video-microscopy. After removal of endogenous hyaluronan by hyaluronidase, cultured ciliated epithelial cells were exposed to 50  100 µg/ml hyaluronan with an average molecular weight of ~100 kDa, and CBF increased by about 15% above baseline.26 This increase was independent of the commercial hyaluronan source (hyaluronan from both Worthington and Seikagaku were equally effective). Hyaluronan digested (18 h) with hyaluronidase, however, had no effect on CBF.27 These findings contrast with a previous study by Morimoto et al.28 in which large molecular weight hyaluronan (>1,000 kDa) had no influence on nasal cell CBF. However, multiple studies have now shown that lower molecular weight hyaluronan has more pronounced biological effects on a variety of cell signaling events compared to large molecular weight hyaluronan. Thus, these findings are not necessarily surprising and clearly not contradictory. In fact, one could speculate that hyaluronan normally secreted into the airways will not affect CBF because of its fairly large average molecular weight (several hundred kDa). However, if hyaluronan is depolymerized in the airways (by reactive oxygen or nitrogen species, for instance), CBF is stimulated. This would fit well into an innate host defense response, i.e., an attempt to remove noxious stimuli from the airways. While hyaluronan stimulated CBF, functionally blocking anti-RHAMM antibodies completely abolished the response to hyaluronan. Cells exposed to nonspecific, control rabbit anti-chicken IgG responded to hyaluronan with an increase in CBF indistinguishable from untreated controls (Fig. 7). These experiments reveal a clear functional role of RHAMM in increasing CBF. RHAMMs exact function in this process is unclear, however, since it lacks a transmembrane signaling component. Future studies are necessary to unravel this interesting problem, especially since the few signaling pathways known to be activated by RHAMM (e.g., ERK) have not been reported to regulate CBF and are usually slower than the observed responses of CBF to hyaluronan. The increase in hyaluronan-induced CBF is blocked by anti-RHAMM antibodies. The CBF of ovine tracheal epithelial cells in primary cultures was measured in the presence of IgG control antibodies (a and b) or anti-RHAMM antibodies (c). Continuous recordings of CBF are shown in response to exogenous 50 µg/ml hyaluronan (each n ≥ 8). There were two types of responses: (a) a transient, but continuous increase in CBF, and (b) an oscillatory response. Both types of CBF responses to hyaluronan were blocked using anti-RHAMM antibodies (c). All cells responded to 20 µM ATP with a statistically indistinguishable, transient increase in CBF (a-c). The duration of drug application is indicated by labeled horizontal bars (arrows indicate continued presence of drug). Reprinted with permission from FASEB J 15(12):2179-86. The fact that at least some airway hyaluronan is immobilized at the apex of the airway epithelium where it can bind and retain secreted proteins contradicts the commonly held notion that enzymes secreted onto epithelial surfaces are rapidly cleared by mechanical action. Since other mucosal secretions contain hyaluronan and possibly other glycosaminoglycans, these observations in the airways may be also relevant to other epithelia bathed in secretions and cleared by mechanical processes. How hyaluronan binds to TK and other airway proteins is not known and could occur by several mechanisms. The three-dimensional structure of TK contains basic amino acids close to the active site of TK that potentially could bind HA. On the other hand, the LPOs amino acid sequence does not contain a link module or an obvious potential hyaluronan-binding site. As discussed above, LPO has an alkaline pI and could interact by nonspecific ionic interactions with glycosaminoglycans. In fact, hyaluronan (or other glycosaminoglycans/proteins interacting with hyaluronan) may act in general as cation exchangers that could bind several other cationic proteins present in the airway, many of which are antibacterial proteins, and peptides such as defensins. In summary, we propose a model (Fig.8) in which hyaluronan serves a previously unrecognized pivotal role in mucosal host defense. Hyaluronan retains and regulates enzymes important for homeostasis at the apical mucosal surface, releasing them and activating some of them into the airway lumen at times of insult to the epithelium when hyaluronan is degraded. Simultaneous with the release of enzymes, smaller hyaluronan fragments stimulate ciliary beating (through its interaction with RHAMM) and hence the clearance of foreign material from mucosal surfaces. The data shown here suggest a new paradigm of mucosal defense that involves epithelial-bound hyaluronan retaining a pool of molecules important in host defense, "ready for use" and protected from ciliary clearance. Model of hyaluronan function in the airway. Secretions from submucosal gland cells contain hyaluronan ( ), LPO and TK. Hyaluronan binds to RHAMM ( ) and maybe other surface receptors (not shown). RHAMM is depicted on ciliary membranes, although no formal evidence of its expression at this location has been obtained. The interaction of hyaluronan with RHAMM stimulates CBF and thereby mucociliary clearance to enhance removal of foreign particles. Simultaneously, LPO and TK are retained at the apical surface and protected from mucociliary clearance. LPO binds directly or indirectly to hyaluronan via electrostatic interactions (not shown), whereas TK binding to hyaluronan is specific and inactivates TK. The normal turnover rate of hyaluronan at the airway surface remains to be determined. However, if insults induce the release of reactive oxygen species (ROS; e.g. in asthma) or the release of hyaluronidases, hyaluronan is depolymerized, TK is released and thereby activated (TKa) to produce kinins that cause bronchoconstriction. Several questions remain: Is there another apical surface hyaladherin besides RHAMM, how is RHAMM signaling to increase CBF, and how is the turnover or exchange of apical intracellular and extracellular RHAMM regulated ?